The Greeks believed that gods and goddesses watched over them. These gods were a bit like humans, but they lived forever and were much more powerful. They felt human emotions, like love, anger and jealousy, and they did not always behave themselves. The Greeks thought the gods lived high above Mount Olympus, in a palace in the clouds. From here, they kept an eye on life below. From time to time, they would interfere in what was going on. They could send storms if they were angry and decide who was victorious in wars. Sometimes they even played tricks on humans too. What were Greek temples like? The Greeks built temples to their gods and goddesses. Some temples were small, while others were very grand and beautiful with amazing decorations. Every city in Greece had a 'patron' god or goddess.People believed patron gods protected them from harm. When people needed help from the gods, they went to the temple to pray. They might go if they were feeling sick, going on a journey or worried about the harvest on the farm. To please the gods, people brought gifts of money, flowers, food and drink. They offered these gifts as sacrifices. Animals, like cattle, were sometimes killed as sacrifices. Then people feasted on the roasted meat. 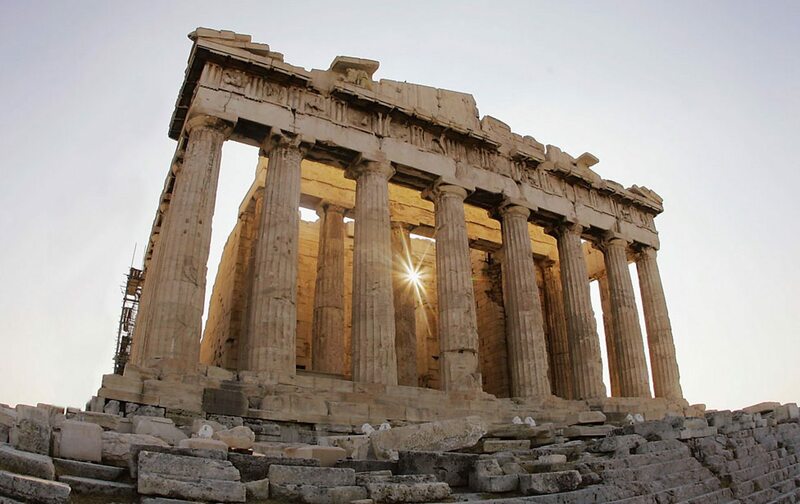 The most famous temple in Greece was the Parthenon in Athens. Inside stood a giant statue of Athena, the patron goddess of the city. Who was the Greeks' favourite hero? The Greeks loved to share stories about brave heroes and their great adventures. Everyone’s favourite hero was Heracles (the Romans called him Hercules). Heracles was Zeus’s son. He was so strong he could kill a lion with his bare hands. He also sailed with Jason and the Argonauts to find the Golden Fleece and he performed 12 ‘impossible’ tasks. Heracles was very brave, but he was killed when he was tricked into putting on a poisoned robe. However, Zeus liked Heracles so much that he took him to Mount Olympus and made him immortal. 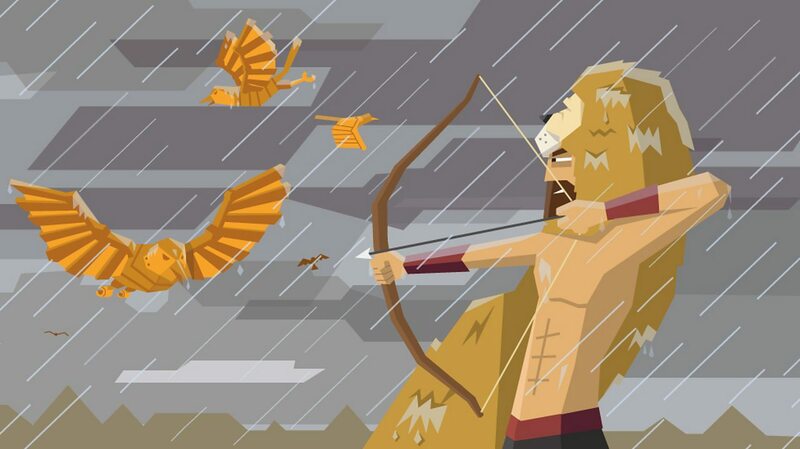 One of the 12 legendary tasks of Heracles was to defeat the Stymphalian birds. These man-eating metallic birds were the pets of the god Ares. Medusa was a Gorgon, she had venomous snakes instead of hair and she could turn people to stone just by looking at them. What happened to dead Greeks? The Greeks believed that the dead went to the Underworld. This was an underground kingdom ruled by the god Hades. To reach the Underworld, dead souls had to cross the River Styx. A grumpy ferryman called Charon would take them across, but only if they paid him. So Greeks would place a coin in the mouth of a dead person at funerals, to make sure they could pay the fare. After crossing the River Styx, three judges decided where the dead person should spend eternity. If they’d been really good, they were sent to live happily forever in the Elysian Fields. If they had been ok, they were sent to the Asphodel Meadows. But if they had been really bad, they ended up in Tartarus. This was a really horrible pit where their soul was tortured for all eternity. 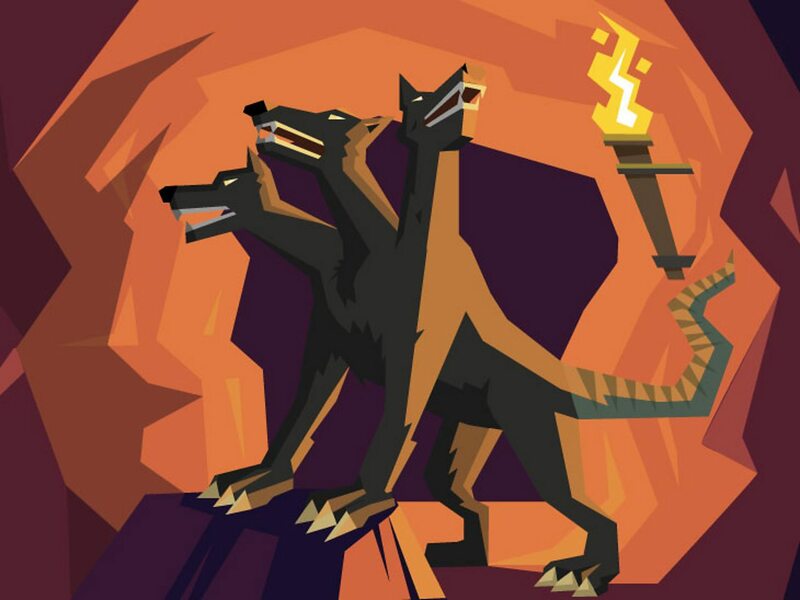 The entrance to the Underworld was guarded by a three headed dog called Cerberus.